The Pearl PFA-207ES Alto Flute is a reliable and affordable instrument ideal for intermediate players. 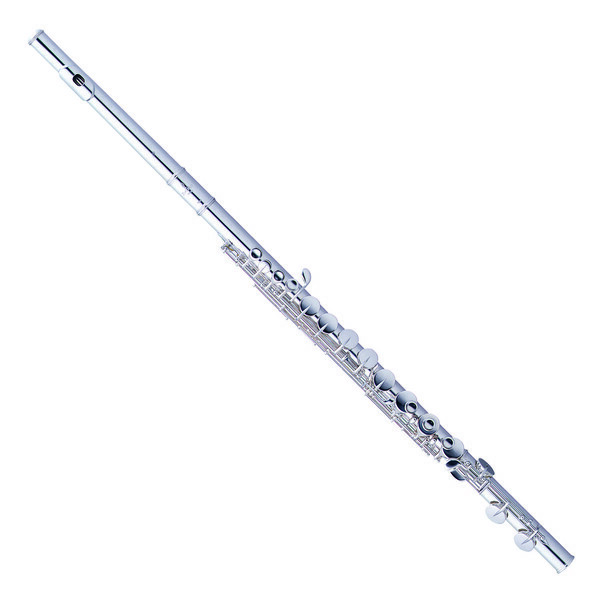 Featuring a Sterling Silver body and headjoint, along with the ergonomic Split E mechanism for improved playability and an extended "B" footjoint, this high quality student flute is versatile, responsive and fun to play, sure to satisfy most any player. Designed with playability in mind, the flute's Split E mechanism allows you to play the difficult top E - typically a weak sounding and unreliable note - with far greater ease and consistency. The flute is also made using Pearl's innovative Pinless construction and One-Piece Core Bar, providing it with an extremely comfortable feel, as well as preventing many of the usual wear and tear problems associated with traditionally made flutes. The flute features an extended "B" footjoint, which allows the instrument to play a semitone below the lowest note of the standard footjoint, although as the Alto flute is a transposing instrument, this note sounds as a low F# rather than B. As well as improving the instrument's range, the longer tube adds a little extra resistance as you play, providing the flute with a darker, more mellow tone.